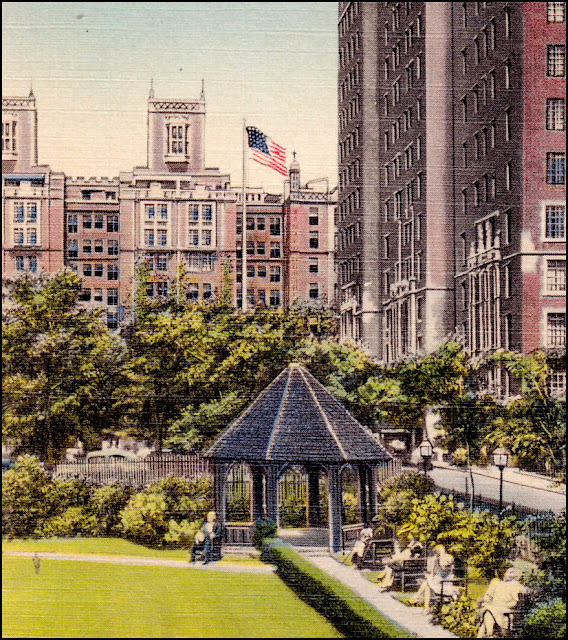 The Tudor City flagpole, planted in the southeast corner of the North Park, was a short-lived structure, in place from 1934 to 1949. It was quite tall, extending far above the tree lines. 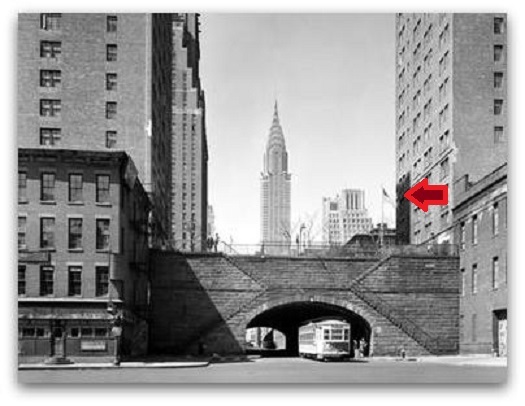 Looking west from First Avenue, the flag flying above the 42nd Street tunnel. Above, a circa-1949 rendering of the planned modernization of 42nd Street for the arrival of the United Nations. Although the flagpole appears in the sketch, it did not make the cut. Following the widening of Tudor City Place (and narrowing of the parks), the North Park was redesigned, sans flagpole. There's still a flagpole in the complex today, a much smaller version over the entrance to the Post Office in No. 5. Tradition dies hard in Tudor City.